These are for use when mounting the above fog lamps to either the bumper bars or the bumper brackets. 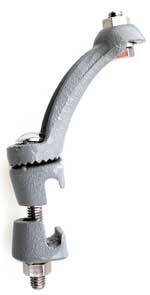 If mounting to the bumper brackets, the slots in the clamping portion of the bracket will need to be enlarged slightly. The upper portion of the bracket can be rotated 360 degrees to place the fog lamp in the desired position. Can be used with 1926-27 Model T's or any Model A's. Sold each. 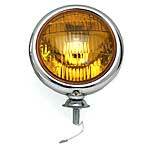 6 volt vintage style fog lamp. 5 inch Chrome rim with 4 inch amber lens. Perfect for vintage cars and hotrods. 12 volt vintage style fog lamp. Replacement 6V fog Lamp bulb unit for the A-18105 Fog Lamp. 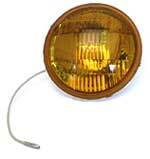 Replacement 12V fog Lamp bulb unit for the A-18105-12 Fog Lamp.